Workforce Misconception: "Manufacturing Equals Low Wages"
Manufacturing has something of a PR problem. The average American manufacturing and CNC machining job takes place in a high-tech shop and involves the kind of math and coding you’d find in an IT post, but many people still think the work is something only those poor souls unfit for other occupations do. Worse, many people assume the work takes place in dirty, poorly lit factories amid dangerous conditions and that the pay amounts to peanuts. Parents shudder to think of their children as machinists, and teachers fail to guide students who might not want to spend their lives at a desk toward a more interesting career in manufacturing. It’s a shame. CNC machining and other forms of manufacturing work can be remarkably lucrative, challenging and rewarding work. The average annual salary across the board is over $77,000, and in Washington D.C., the average annual salary tops $130,000. Poor souls unfit for other work? Hardly. Manufacturing in America may still be trying to recover its footing, but for the individual working in it, it can make for a great career path. So why does the misconception remain? Or more importantly, how do we change the perception? On the map below, see how your own state stacks up in terms of manufacturing wages, and be sure to tell anyone who thinks otherwise, that manufacturing equals good, well-compensated work. 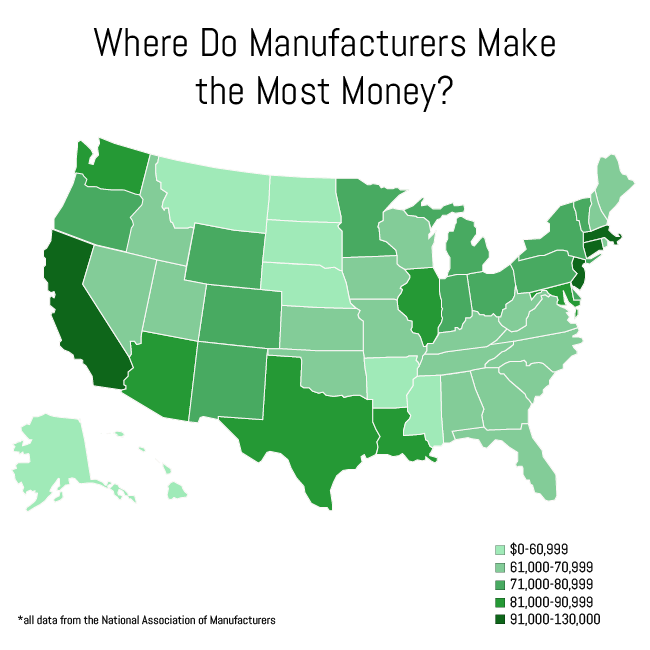 Map of manufacturing and CNC machining wages across the United States. If you’re a middle school or high school student in the state of Kentucky and you’d like more information on how you could get a free education and a great job in advanced manufacturing, check out AMT and Kentucky FAME. Want to learn more about our powerful alternative to traditional contract CNC machining? Click here.